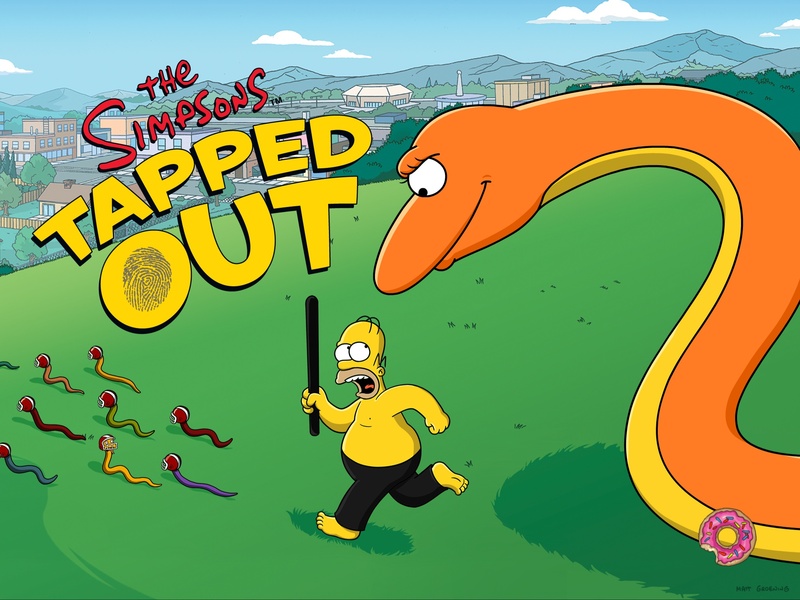 The Simpsons: Tapped Out Whacking Day 2016 content update was released on May 9, 2016 and was the one hundred and twentysixth content update. It was added to the game on May 4, 2016 with an ingame update but won't trigger till May 9. 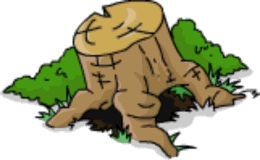 It added a new character to the game and offers Whacking Day 2013 items again. 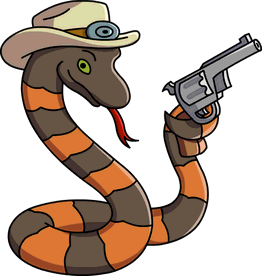 Western Snake FREE Unlocked after completing The Whack is Back Pt. 3. 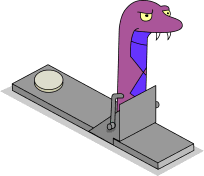 Lumpy Unlocks in the Whacking Day Bundle. Returns from Whacking Day 2013. Pet Snake 25 Returns from Whacking Day 2013. 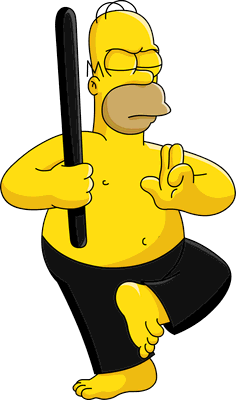 Ninja Homer Unlocks with Ninja Homer Practice Snake. Returns from Whacking Day 2013 and Yard Sale 2014. Bare Chested Willie 60 Returns from Whacking Day 2013, Yard Sale 2014 and Terwilligers. Returns from Whacking Day 2013 and Treehouse of Horror 2015. 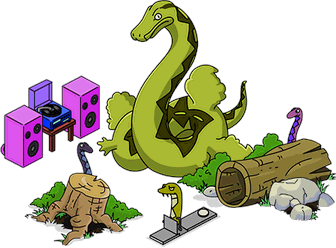 Also unlocks in the Whacking Day Bundle. 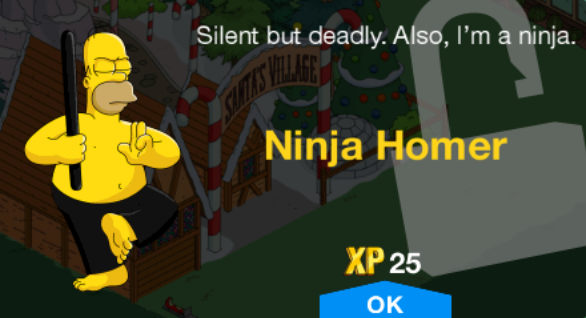 Ninja Homer Practice Snake Unlocks Ninja Homer. Wind Sock 19,000 Returns from Whacking Day 2013. 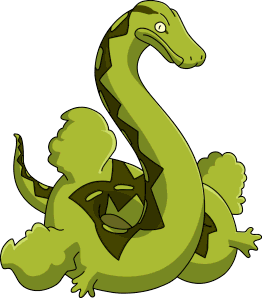 Green Practice Snake Unlocks in the Whacking Day Bundle. Fort Sensible is available in Wild West Act 2. Snake Statue and Balancing Beam w/Gymnastic Lisa didn't return. 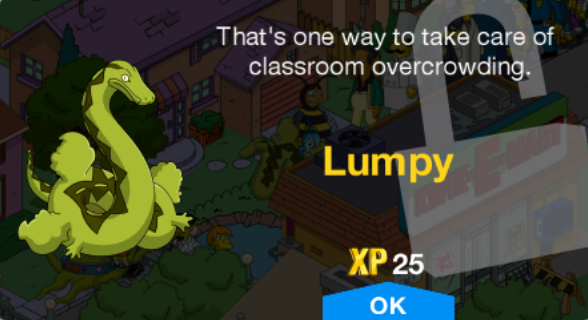 Whacking Day Bundle 125 Requires Lumpy to not be unlocked. Green Practice Snake, Purple Practice Snake, Red Practice Snake and Yellow Practice Snake. 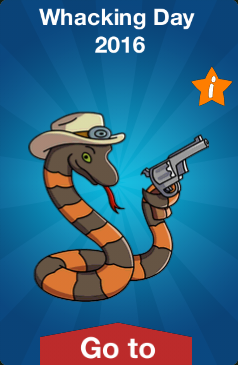 Notes: Every tapped snake gives you 10 Wild West Event Currency! Tapping Snake Speakers attracts the snakes to them! LISA!!!! Do you know what day is almost here?! I'll give you a hint: it involves whacking, and it's a day. 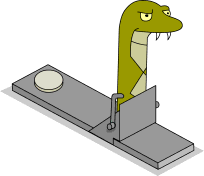 Can we just skip our beloved family snake-bludgeoning festival this year? Look around! It's Western times! Let's just focus on the current theme! Can't we lay off the animals, and just focus on gunning down our fellow human beings? Not this year, Lisa! You tricked me out of Whacking Day for the last two years in a row. Besides, I'm tired of battling humans in the streets. Humans are smart! Cold-brained reptiles are much easier to hunt! Fine. 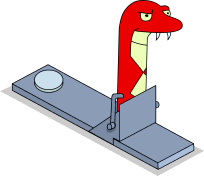 But no snake-whacking! We're going to do this thing my way! System Message Stock up on traditional Whacking Day goodies before it's too late! Lisa, if we just PAT the snakes, they'll lose respect for us. And respect for humans is probably very important in snake culture. Can't I whack just one? Can you just smack them around a little? That might not be too bad. Well, it's not as good as murder. Any idiot could see that. But I suppose it's better than just leaving the snakes alone. Which would be AWFUL. Dad, the snakes look miserable. Can't we just leave them alone? If you take getting whacked away from the snakes, they've got nothing. Everything you're saying is incredibly selfish and inhumane. Ugh, fine, I'll stop. And I was just about to double whack a big one! His head's a little bumpy, but we'll just put a hat on him and he's good as new! You know what the best kind of comedy is? Improv! Last week you said improv was the worst kind of comedy. Oh, it is. The jokes are terrible. But you laugh like crazy at them anyway... which is what makes it the best kind of comedy. So bad jokes that people come up with on the spot are actually good jokes? Can you imagine if someone actually did improv with good jokes? 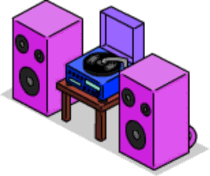 System Message Watch Homer, LIVE for the first time ever, as he improvs to your Tweets on The Simpsons this Sunday, 8/7 central on FOX! Oh no, dude, you've figured out my secret weakness: kickin' bass. 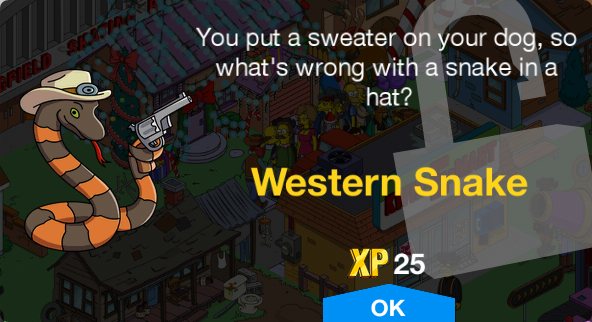 Homer what are you doing here in that get up? This is the Wild West! 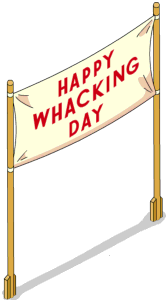 Yeah, we haven't had a Whacking Day in years! Why don't you make like a ninja and vanish. Dad? Everyone loves Whacking Day but I hate it. Is there something wrong with me? Just squeeze your rage into a bitter little ball and release it at an appropriate time. Like that day I hit the referee with a whiskey bottle. Remember that? 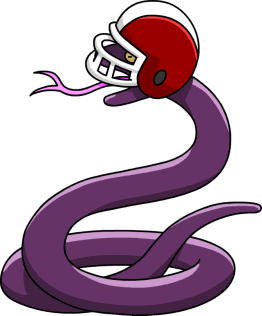 I'm tired of hitting the same practice snake. Someone needs to buy me more! Dad, those Practice Snakes cost 10 donuts. Hey, no one's ever become a ninja without spending lots of money. 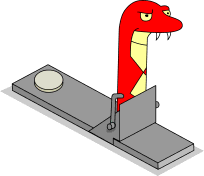 I'm tired of whacking just snakes. It's time for bigger game! Glass on the front lawn. It looks like someone vandalized my house! Did you see anything, Homer? Although I did see some snakes loitering outside your house. I think they were in a snake gang. Looks like these snakes are getting too big for their boots. It's time to take action. Yay! I'll rally the troops. All fake snakes fake fear the power of the ninja! *sobbing* I love this time of year. 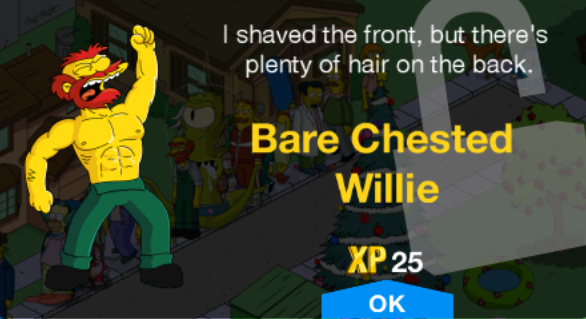 A Whacking Day mini-update and promo dialogue for Simprovised were added and set to start on May 9th at 7am GMT. The job Do Narobics isn't present anymore in characters' job list unless the quest is active. Fixed a glitch with the Rocket Launch Pad and Yellow Submersible not working correctly. Fixed a glitch with the Pool. Red Practice Snake and Yellow Practice Snake were added to the Miscellany inventory group. 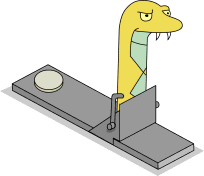 Ninja Homer's Fake-Whack Pretend Snakes job animation was changed. Lisa's dialogue in Wing Chun For Dummies was changed to sad expression. 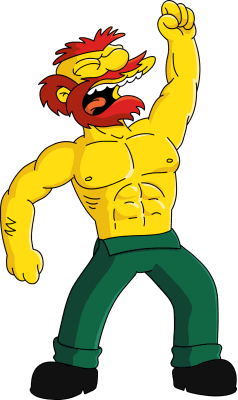 Shredded Ned's jobs were restored. General Store's Daily Cap for Act 1 and 3 were changed. Act 3 Prizes cost was raised. Adjacent roads returned to normal, now creating a full line in the middle again, unless a road is placed afterwards above it to divide it. Modified on June 5, 2018, at 03:41.